Synaptotagmins (Syts) play a key role in the regulation of Ca2+-triggered exocytosis and membrane fusion events, two crucial events associated to the phagocytic process. In the present study, we investigated the role of Syt V, a regulator of focal exocytosis, in phagocytosis. In macrophages, Syt V is localized on recycling endosomes and on filopodia-like structures and is recruited to the nascent phagosomes independently of the phagocytic receptor engaged. Silencing of Syt V by RNA interference revealed a role for this protein for phagocytosis, particularly under conditions of high membrane demand. In contrast, silencing of Syt V had no effect on the recruitment of the lysosomal marker LAMP1 to phagosomes, indicating that phagosome maturation is not regulated by Syt V. Collectively, these results illustrate the importance of Syt V in the regulation of an important innate function of macrophages. Furthermore, our results are consistent with the concept that focal exocytosis of endocytic organelles is a key event in phagocytosis and suggest that Syt V regulates this process. Phagocytosis is an essential arm of the innate response against infections, as it represents the process by which professional phagocytes internalize and destroy invading microorganisms (1, 2). During internalization, target particles are surrounded by pseudopods and are engulfed in a vacuole, the phagosome, which rapidly matures into a microbicidal phagolysosome. Whereas the nascent phagosome is formed to a large extent by invagination of the plasma membrane (3), the membrane surface required to internalize multiple or large targets may represent an area equivalent to the entire cell surface (4). Such a requirement suggests that membrane from intracellular sources contributes to the phagocytic process. Indeed, phagosome formation is accompanied by the exocytosis of endomembranes into the plasmalemma (4). Two compartments contribute to focal exocytosis during phagocytosis: the VAMP3- and Rab11-positive recycling endosomes (5, 6, 7) and the TI-VAMP/VAMP7-positive late endosomes/lysosomes (8). Evidence that soluble N-ethylmaleimide-sensitive factor attachment protein receptors (SNAREs)3 associated to the endoplasmic reticulum are required for phagocytosis support a role for this organelle during phagocytosis (9, 10). However, this remains controversial (11). Nevertheless, the fact that both vesicle- and plasma-membrane associated SNAREs are essential for focal exocytosis and particle internalization (4, 5, 8, 10) illustrates the importance of membrane fusion regulators during phagocytosis. Synaptotagmins (Syts) are a large family of transmembrane proteins characterized by the presence of tandem C2 domains which act as Ca2+ sensor, and regulate membrane fusion during exocytosis via interaction with SNAREs and membrane lipids (12, 13). Although several SNAREs modulate phagocytosis by controlling membrane fusion during focal exocytosis, little is known concerning the potential roles of Syts in phagocytosis. This is an important issue because for the SNARE complex to drive rapid membrane fusion in response to Ca2+ influx, additional factors, including a Ca2+ sensor(s), are required. In this regard, a recent study revealed that consistent with its role as a regulator of lysosomal exocytosis (14, 15, 16), Syt VII plays a key role in the delivery of lysosomal membrane to the phagosome (17), possibly acting in concert with VAMP7 (8). In neutrophils, the presence of Syt II on phagosomes suggested a role for this Ca2+ sensor during phagocytosis and secretion (18). Several signaling molecules, including members of the protein kinase C (PKC) family of protein serine/threonine kinases, are activated during phagocytosis and associate to the phagosome during the maturation process (19, 20, 21, 22, 23). We previously obtained evidence that PKC-α plays a role in phagolysosome biogenesis (24), and, while investigating the mechanisms by which PKC-α modulates phagocytosis, we identified Syt V (25) as a molecule potentially interacting with PKC-α in phagosomes preparations (A.F.V. and A.D., unpublished observations). Syt V is predominantly associated to dense-core vesicles in neuronal cells (26) and pancreatic β cells where it regulates vesicle exocytosis (27, 28). In this study, we provide evidence that, in macrophages, Syt V plays a role in the regulation of phagocytosis. Peritoneal exudate macrophages (PEM) were obtained from peritoneal lavages of 8- to 10-wk-old female C57BL/6 mice (Charles River Laboratories). PEM and the mouse macrophage cell lines J774 and RAW 264.7 were cultured in DMEM with l-glutamine (Life Technologies) supplemented with 10% heat-inactivated FBS (HyClone), 10 mM HEPES (pH 7.4), and antibiotics (complete medium) in a 37°C incubator with 5% CO2. Leishmania donovani promastigotes (strain 1S) were grown as described (29). The SytV-GFP cDNA (26) was inserted into the NotI site of the bicistronic expression vector pCIN-4 (30). The resulting construct was electroporated into RAW 264.7 cells as described (31). Transfectants were selected in complete medium containing 500 μg/ml G418 (Life Technologies) and individual clones were harvested, expanded, and examined for Syt V-GFP expression. Total RNA was extracted with RNAzol B (Tel-Test), treated with DNaseI (BD Biosciences), and reverse transcribed with AMV reverse transcriptase (USB). cDNA was used for PCR using the following forward (F) and reverse (R) primers for Syt V: F: 5′-CCCTTTTTGGTGTCTCTCTTTTCG-3′ (AD-329) and R: 5′-AGTCCTTGGCAGGCAGATTGAC-3′ (AD-330). For hypoxanthine phosphoribosyltransferase, the primers were F: 5′-GTTGGATACAGGCCAGACTTTGTTG-3′ (AD-55) and R: 5′-GATTCAACTTGCGCTCATCTTAGGC-3′ (AD-56). Adherent macrophages (5 × 107 per 150 × 20 mm tissue culture dishes) were incubated with latex beads (0.75 μm diameter, 10% suspension, blue dyed; Sigma-Aldrich) diluted 1/25 in 10 ml complete medium at 37°C for 30, 60, 90, or 120 min. Cells were then washed three times in cold PBS at 4°C and scrapped with a rubber policeman in cold PBS. Phagosomes were isolated by flotation on a sucrose gradient as described (24). Cells and purified phagosomes were lysed in ice-cold lysis buffer (20 mM Tris-HCl (pH 7.5) and 1% Nonidet P-40) containing protease and phosphatase inhibitors. Phagosomal proteins (30 μg) and total cell lysates (10 μg) were separated on 8% SDS-PAGE, transferred onto Hybond-ECL membranes (Amersham Biosciences), and immunodetection was achieved by chemiluminescence (Amersham Biosciences). The rabbit anti-Syt V spacer Ab was raised against the cytoplasmic region between the transmembrane and the C2 domain (aa 71–216) and was affinity-purified.The rat anti-Lamp1 developed by J. T. August (1D4B) was obtained through the Developmental Studies Hybridoma Bank at the University of Iowa, and the National Institute of Child Health and Human Development. The monoclonal anti-EEA1 Ab was from Dr. Michel Desjardins (Université de Montreal, Montreal, Canada). Monoclonal rat anti-mouse transferrin receptor TfR Ab was from Cedarlane Laboratories. For the silencing of Syt V by RNAi, we used a small interfering RNA (siRNA) corresponding to nucleotides 94–112 of Syt V cDNA (28), whereas an siRNA specific to GFP (32) was used as a negative control. Adherent RAW 264.7 cells were transfected with siRNA duplexes at a final concentration of 240 nM using OligoFectamine (Invitrogen) as described (32). A BLAST search against the mouse genome sequence database was performed to ensure that the chosen siRNA sequences targeted only the mRNA of interest. IgG-opsonized SRBC (IgG-SRBC) were prepared as described (19). Red fluorescent beads of different diameters (0.75 μm from Estapor microsphere and 3 μm from Polyscience) were opsonized with mouse IgG. Zymosan (Sigma-Aldrich), Zymosan-Alexa 488 and -Alexa 568 (Molecular Probes) and L. donovani promastigotes were opsonized with mouse serum (33). For synchronized phagocytosis assays, macrophages were incubated with particles at a particle-to-cell ratio of 15:1 (unless otherwise specified) for 20 min at 4°C. Excess particles were removed and phagocytosis was triggered by transferring the cells to 37°C for the indicated time points before processing for microscopy. Macrophages were fixed, permeabilized using 0.1% Triton X-100, and nonspecific surface FcγR binding were blocked using 1% BSA, 2% goat serum, 6% milk, and 50% FBS. Particle internalization was quantified by immunofluorescence microscopy. Results are based on at least 100 cells chosen by blinded scoring in triplicate. For distribution and colocalization experiments, cells were labeled with the appropriate combinations of primary Abs (anti-Syt V, LAMP-1, transferrin receptor, EEA1, or PKC-α), and secondary Abs (anti-rabbit AlexaFluor 568 or AlexaFluor 488, anti-rat AlexaFluor 488, anti-mouse AlexaFluor 488, or anti-mouse AlexaFluor 568; Molecular Probes). All coverslips were mounted on slides with Fluoromount-G (Southern Biotechnology Associates). Detailed analysis of protein localization on the phagosome was performed essentially as described (29) using an oil immersion Nikon Plan Apo 100 (N.A. 1.4) objective mounted on a Nikon Eclipse E800 microscope equipped with a Bio-Rad Radiance 2000 confocal imaging system (Bio-Rad). Statistical analyses were performed using Student’s two-tail two-sample unequal variance test. Using a proteomic approach, we sought to identify proteins in latex bead-phagosome lysates that coimmunoprecipitated with PKC-α (A.F.V. and A.D., unpublished observations), and we found several proteins including Syt V (NP_068689). Two Syt V sequences were reported at the same time, and the 491AA-Syt V identified by Li et al. (34) will be analyzed in this paper. Given the importance of Syts in the regulation of exocytosis and membrane fusion (13, 35), we further investigated the potential role of Syt V in phagocytosis. Syt V had not previously been shown to be expressed in macrophages and we confirmed by RT-PCR that it is expressed in the macrophage lines RAW 264.7 and J774 (Fig. 1⇓A). The PC12 neuronal cell line was used as a positive control. Using an Ab against the Syt V spacer domain (26), we detected by Western blot the presence of Syt V in J774 and PC12 cell lysates as well as in 90 min-old latex bead-phagosome extracts (Fig. 1⇓B). Confocal immunofluorescence microscopy revealed that Syt V is present on intracellular vesicles and on filopodia-like structures (Fig. 1⇓C). After 30-min phagocytosis, we observed the recruitment of Syt V to phagosomes containing various particles (latex beads, zymozan, serum opsonized-zymozan, and IgG-SRBC) (Fig. 1⇓D). Using RAW 264.7 cells stably expressing a Syt V-GFP fusion protein, we observed that similar to Syt V, Syt V-GFP was recruited to phagosomes containing either latex beads, zymozan, serum opsonized-zymozan, or IgG-SRBC (Fig. 1⇓D). To assess the specificity of our anti-Syt V Ab, we performed immunofluorescence staining in the absence or the presence of the GST-Syt V spacer domain fusion protein used for immunization. As shown in Fig. 1⇓E, presence of the GST-Syt V spacer domain strongly reduced Syt V staining on both intracellular vesicles and on zymozan-containing phagosomes in PEM. Taken together, these data indicate that Syt V is recruited to phagosomes, independently of the phagocytic receptors involved. Syt V is expressed in macrophages and is recruited to phagosomes. A, Syt V is expressed in RAW 264.7 and J774 macrophages, as assessed by RT-PCR. PC12 cells were used as positive control. B, Syt V is present in total cell and phagosome lysates from J774 cells. Western blot analysis was performed on 30-μg 90-min-old phagosome lysates and 10 μg total cell lysates (TCL). PC12 cells were used as positive control. Arrows show the two Syt V forms present in macrophages. C, Syt V is localized on intracellular vesicles and on filopodia-like structures in RAW 264.7 cells, as determined by confocal microscopy. Bar, 5 μm. D, Syt V is recruited to phagosomes independently of the phagocytic receptor involved. RAW 264.7 cells or RAW 264.7 cells stably expressing the Syt V-GFP fusion protein were allowed to internalize either latex beads, zymozan, serum-opsonized zymozan, or IgG-SRBCs for 30 min. Syt V (top panel) and Syt V-GFP (bottom panel) were localized by confocal microscopy. Bar, 3 μm. 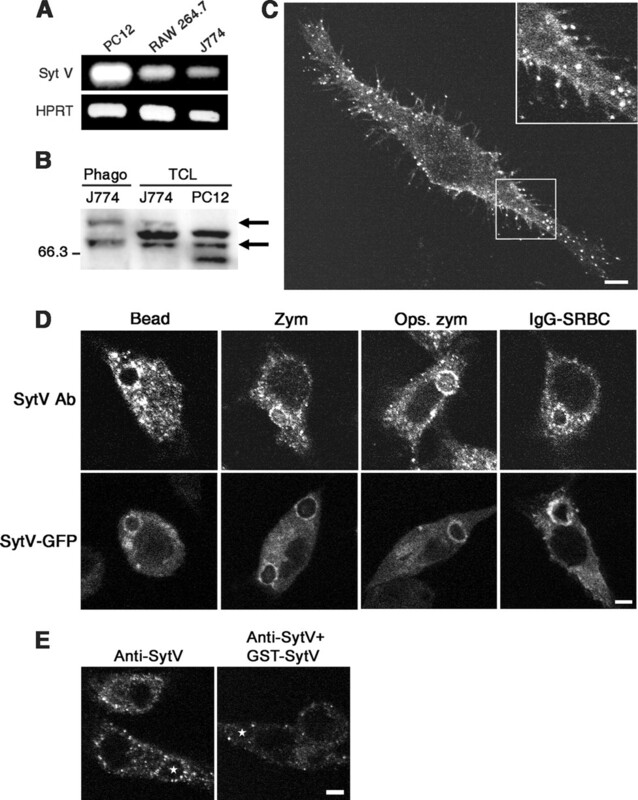 E, Immunolocalization of Syt V in the presence of the GST-Syt V spacer domain fusion protein used to generate the anti-Syt V Ab eliminated most of the Syt V labeling both on intracellular vesicles and on zymozan-containing phagosomes (indicated by an ∗) in PEM. Bar, 3 μm. Results are representative of three independent experiments. To further characterize the recruitment of Syt V to phagosomes, we first determined its kinetics of phagosomal association during the phagocytosis of serum-opsonized zymozan. 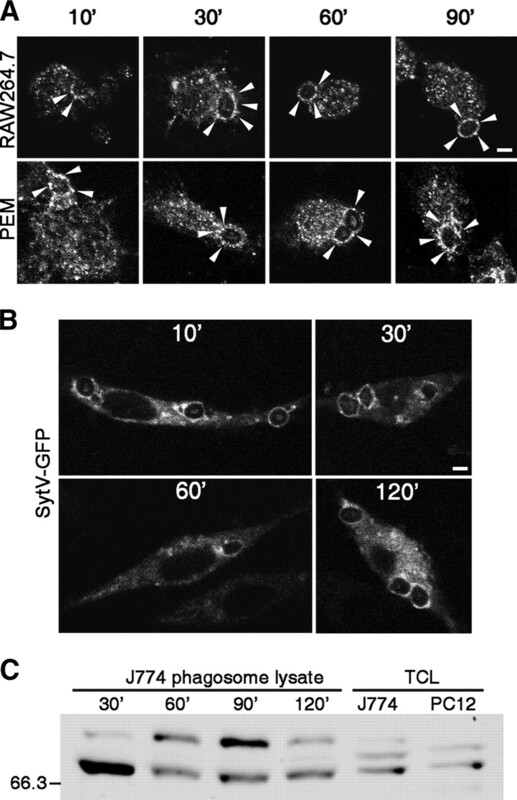 Confocal microscopy revealed that in both RAW 264.7 cells and PEM, Syt V was recruited early to phagosomes and remained throughout the maturation process (Fig. 2⇓A). The recruitment of Syt V-GFP to phagosomes containing serum-opsonized zymozan followed a kinetics pattern similar to that of Syt V (Fig. 2⇓B). Similarly, Western blot on J774 latex bead phagosomes lysates prepared at various time points after the start of phagocytosis showed that the relative abundance of the two phagosome-associated Syt V forms varies during the phagosome maturation process (Fig. 2⇓C). These two forms of Syt V may represent different posttranslational modifications, such as phosphorylation, as previously observed with Syt IV and Syt IX (36, 37). We next compared the recruitment kinetics of Syt V and LAMP1 to phagosomes containing serum opsonized-zymozan by confocal microscopy. Consistent with its lysosomal localization, we detected LAMP1 on phagosomes at later time points (60 and 90 min), whereas Syt V was present from early time points (Fig. 3⇓A). The observation that Syt V and LAMP1 were recruited to phagosomes with distinct kinetics is consistent with the lack of colocalization of both proteins (Fig. 3⇓A) and indicated that Syt V is not associated with late endosomal or lysosomal compartments. Furthermore, Syt V showed occasional colocalization with the early endosome marker EEA1, whereas it frequently colocalized with the recycling and early endosome marker transferrin receptor (Fig. 3⇓B). These results indicate that Syt V associates with the recycling endosomal compartment. Syt V is recruited early to phagosomes and remains during the maturation process. A, Syt V was localized by confocal microscopy at various time points after the initiation of internalization of serum-opsonized zymozan by either RAW 264.7 cells (upper row) or PEM (lower row). Bar, 3 μm. B, Syt V-GFP was localized by confocal microscopy at various time points after the initiation of internalization of serum-opsonized zymozan by RAW 264.7 cells stably expressing Syt V-GFP. Bar, 3 μm. C, Two Syt V forms are present on latex bead-containing phagosomes isolated from J774 cells at various time points after the start of internalization. Western blot analysis was performed on 30-μg phagosomes lysates and 10 μg total cell lysates (TCL) from J774 and PC12 cells. Similar results were obtained in three independent experiments. Intracellular localization of Syt V in PEM. A, Syt V and LAMP1 do not colocalize and associate to serum-opsonized zymozan-phagosomes with distinct kinetics. Bar, 3 μm. B, Syt V colocalizes with the recycling endosome marker transferin receptor (shown by arrowheads, upper row), whereas little colocalization was observed with the early endosome marker EEA1 (shown by arrowheads, lower row). Bar, 3 μm. To study the potential role of Syt V in phagocytosis, we used RNAi to inhibit its expression. Transfection of RAW 264.7 cells with a siRNA to Syt V (28), significantly decreased Syt V levels after 24 h (Fig. 4⇓A). In contrast, intensity of the two Syt V forms was similar in RAW 264.7 macrophages transfected with a siRNA to GFP and in control mock-transfected RAW 264.7 cells. Confocal immunofluorescence analysis indicated that Syt V was efficiently silenced by the siRNA Syt V treatment with most cells showing reduced fluorescence intensity (Fig. 4⇓B). We next determined the impact of Syt V silencing on the phagocytosis of serum opsonized-zymozan and IgG-SRBC. Both CR- and FcγR-mediated phagocytosis were inhibited by over 50% in the absence of Syt V, revealing its role in phagocytosis (Fig. 4⇓C). Importantly, this inhibition was not the consequence of a defective particle binding, as Syt V depletion had no effect on the association of serum opsonized-zymozan and IgG-SRBC to macrophages (Fig. 4⇓C). Given that Syt V remains associated to phagosomes after particle internalization, we investigated its possible role in phagosome maturation. Silencing of Syt V had no effect on the recruitment of the lysosomal marker LAMP1 to zymosan-containing phagosomes (Fig. 4⇓D), suggesting that Syt V does not a play a significant role in regulating interactions between phagosomes and lysosomes. Silencing of Syt V impairs phagocytosis. RAW 264.7 cells were transfected with either a siRNA to Syt V or a siRNA to GFP, or only mock transfected (control), and incubated for 24 h. siRNA to Syt V efficiently reduced Syt V levels as shown by Western blot (A) and confocal immunofluorescence microscopy (B). Bar, 3 μm. In A, arrows show the two Syt V forms present in macrophages. The middle band is nonspecific. C, siRNA Syt V inhibited CR- and FcγR-mediated phagocytosis (60 min) but not particle binding (0 min). Particle association and phagocytosis were calculated on at least 100 cells, in triplicate. (∗∗, p ≤ 0.0005 vs siRNA GFP). D, LAMP1 is recruited to zymozan-phagosomes in siRNA Syt V-treated macrophages, as determined 90 min after the start of phagocytosis. To address the possibility that Syt V regulates membrane delivery at the phagocytic cup, we determined its requirement for phagocytosis under conditions of high particle loads and for the internalization of large particles. RAW 264.7 cells treated with siRNA Syt V were exposed to serum opsonized-zymozan at various particle-to-cell ratios (Fig. 5⇓A). At 10 min after the initiation of phagocytosis, we observed a 50% inhibition of internalization for the 10:1 ratio and over 70% inhibition of internalization for the 40:1 particle-to-cell ratio in siRNA Syt V-treated cells (Fig. 5⇓B) with respect to control cells. After 60 min, the impact of higher particle-to-cell ratio was less important than at 10 min. Similar results were obtained for the phagocytosis of the promastigote form of Leishmania donovani, a protozoan parasite that replicates inside macrophages (Fig. 5⇓B). We next compared the ability of siRNA Syt V-treated cells and control cells to internalize 0.75 μm and 3 μm IgG-opsonized latex beads at particle-to-cell ratios of 10:1 and 40:1. Silencing of Syt V strongly inhibited the internalization of 3 μm IgG-beads, whereas phagocytosis of 0.75 μm IgG-beads by siRNA Syt V-treated cells was similar to that observed in controls cells (Fig. 6⇓). This suggests that Syt V is involved in the regulation of membrane supply under phagocytic conditions where important quantities of membrane are required. Inhibition of phagocytosis in siRNA Syt V-treated cells increases with particle load. The phagocytosis defect of cells treated with siRNA Syt V increases with particle load. Macrophages were incubated with increasing ratios of serum-opsonized zymozan (A) or L. donovani promastigotes (B) and particle internalization was determined after 10 min and 60 min. The phagocytic index was calculated on at least 100 cells in triplicate (A and B) (∗, p ≤ 0.005; ∗∗, p ≤ 0.0005 vs RNAi GFP). Inhibition of phagocytosis in siRNA Syt V-treated cells increases with particle size. 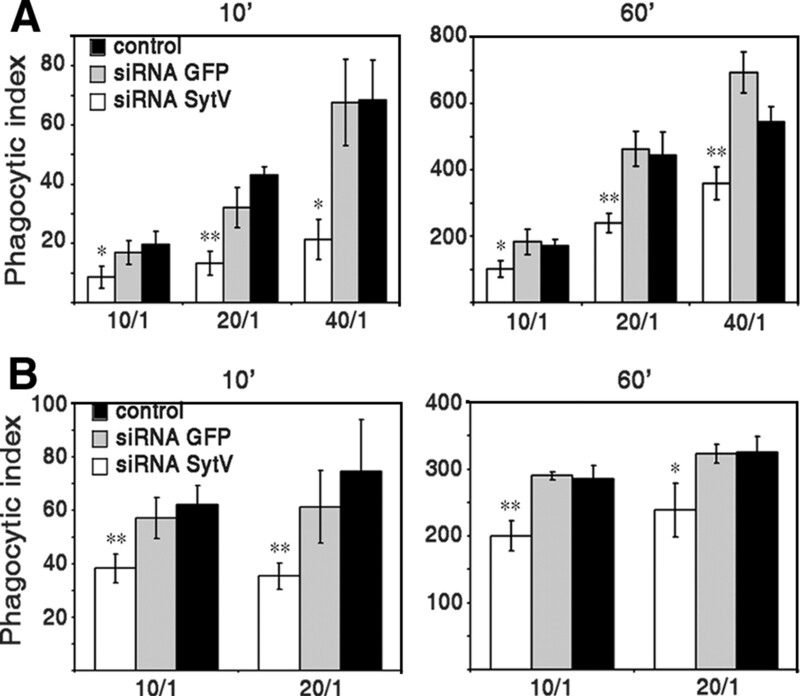 The phagocytosis defect of cells treated with siRNA Syt V increases with particle size. Macrophages were fed with either 3- or 0.75-μm IgG-opsonised beads at ratios of 10:1 and 40:1 and particle internalization was determined after 10 min. The phagocytic index was calculated on at least 100 cells in triplicate (∗∗, p ≤ 0.0005 vs RNAi GFP). Syts play a key role in the regulation of Ca2+-triggered exocytosis and membrane fusion, two important events associated to the phagocytic process. In this study, we identified the Ca2+-dependent exocytosis regulator Syt V as a recycling endosome-associated protein that is recruited to the nascent phagosome in macrophages, independently of the phagocytic receptor involved. Silencing of Syt V by RNAi revealed a critical role for this protein in phagocytosis, particularly in the presence of large particles or a large particle load. Thus, given its role as a regulator of exocytosis (28), Syt V may control the mobilization of recycling endosomes as a source of endomembrane during phagocytosis. Despite their role as regulators of membrane fusion events, few studies have addressed the potential involvement of Syts in the phagocytic process. The best-characterized Syt in phagocytosis is the ubiquitous Syt VII, which regulates Ca2+-dependent exocytosis of lysosomes (14). In the absence of Syt VII, phagocytosis is impaired particularly under conditions of high membrane demand (17). In neutrophils, Syt II is present on granules and is recruited to the phagosome, but its role remains to be determined (18). Current knowledge on the distribution and function of Syt V is very limited. Previous studies showed that it is a dense-core vesicle-specific Syt that regulates Ca2+-dependent exocytosis in brain and endocrine tissues. Hence, in neuronal PC12 cells and in the brain, Syt V is found on dense-core vesicles that undergo Ca2+-dependent exocytosis and, in contrast to other Syts, is absent from synaptic-like microvesicles (26). Consistent with a direct role in Ca2+-dependent stimulation of exocytosis, silencing of Syt V by RNAi strongly inhibited hormone exocytosis by pancreatic β cells (28). In macrophages, we found that Syt V is mainly associated to recycling endosomes and is also present on filopodia-like structures. Recycling endosomes are key players in phagocytosis as this subcompartment of the endocytic pathway is one of the prominent sources of endomembrane recruited to the phagocytic cup (11, 38). Hence, several recycling endosome-associated molecules involved in the regulation of membrane fusion such as VAMP3, Rab11, and Arf6 are recruited to the nascent phagosomes and contribute to the internalization process (5, 6, 7, 39, 40). The recruitment of Syt V to the nascent phagosome is consistent with its localization on recycling endosomes and is functionally important, as phagocytosis of various types of particles was inhibited following its depletion by RNAi. This inhibition was particularly severe when macrophages depleted in Syt V were fed with large particles or with a large particle load. Given that Syt V is a regulator of exocytosis (26, 28), these observations are consistent with a role for Syt V in regulating focal exocytosis of recycling endosomes during phagocytosis. The possibility that Syt V acts in concert with known SNAREs and recycling endosome-associated regulators of phagosome formation (VAMP3, Rab11, and Arf6) remains to be determined. Recruitment of Syt V to the phagosome independently of the phagocytic receptor engaged and its requirement for CR- and FcγR-mediated phagocytosis indicate that Syt V is part of the general phagocytic machinery. The association of Syt V with the phagosome throughout the maturation process raised the possibility that it regulates interactions with the endocytic system. However, acquisition of the lysosomal marker LAMP1 was normal in the absence of Syt V, indicating that Syt V is not involved in phagosome maturation. One possible role for phagosome-associated Syt V could be the regulation of phagosome maintenance and/or expansion (41, 42). Indeed, as intravacuolar microorganisms proliferate within their host cell, the area of phagosome membrane must increase to accommodate the replicating pathogens. This may involve interactions with host cell organelles and vesicular compartments, but the underlying mechanisms remain poorly understood. Syt V was not only present on at the phagocytic cup and on phagosomes but also on plasma membrane, notably on filopodia-like structures. This finding is consistent with the possibility that Syt V-containing recycling endosomes fuse with the plasma membrane to release their content and suggests a more general role for Syt V. Delivery of membrane from recycling endosomes to the phagocytic cup allows rapid release of TNF-α and expands the membrane for phagocytosis (43). Upon macrophage activation, there is an increased vesicular and recycling endosomes trafficking to accommodate cytokine secretion and this is related to the up-regulation of the expression of relevant SNAREs (43, 44, 45). Current studies are addressing the possible role of Syt V in proinflammatory cytokine secretion during phagosome formation. We thank Marcel Desrosiers for assistance with confocal microscopy and Dr. Eric Prina for comments and suggestions. ↵1 This work was supported by Canadian Institutes of Health Research Grant MT-29033. A.D. is a chercheur-boursier of the Fonds de la recherche en santé du Québec and the holder of a Canada Research Chair. A.F.V. was partly supported by a doctoral fellowship from the Fondation Armand-Frappier. ↵3 Abbreviations used in this paper: SNARE, soluble N-ethylmaleimide-sensitive factor attachment protein receptor; IgG-SRBC, IgG-opsonized SRBC; PEM, peritoneal exudate macrophage; PKC, protein kinase C; siRNA, small interfering RNA; RNAi, RNA interference; Syt, synaptotagmin. Silverstein, S. C.. 1977. Endocytic uptake of particles by mononuclear phagocytes and the penetration of obligate intracellular parasites. Am. J. Trop. Med. Hyg. 26: 161-169. Bajno, L., X. R. Peng, A. D. Schreiber, H. P. Moore, W. S. Trimble, S. Grinstein. 2000. Focal exocytosis of VAMP3-containing vesicles at sites of phagosome formation. J. Cell Biol. 149: 697-706. Cox, D., D. J. Lee, B. M. Dale, J. Calafat, S. Greenberg. 2000. A Rab11-containing rapidly recycling compartment in macrophages that promotes phagocytosis. Proc. Natl. Acad. Sci. USA 97: 680-685. Niedergang, F., E. Colucci-Guyon, T. Dubois, G. Raposo, P. Chavrier. 2003. ADP ribosylation factor 6 is activated and controls membrane delivery during phagocytosis in macrophages. J. Cell Biol. 161: 1143-1150. Braun, V., V. Fraisier, G. Raposo, I. Hurbain, J. B. Sibarita, P. Chavrier, T. Galli, F. Niedergang. 2004. TI-VAMP/VAMP7 is required for optimal phagocytosis of opsonised particles in macrophages. EMBO J. 23: 4166-4176. Hatsuzawa, K., T. Tamura, H. Hashimoto, S. Yokoya, M. Miura, H. Nagaya, I. Wada. 2006. Involvement of syntaxin 18, an endoplasmic reticulum (ER)-localized SNARE protein, in ER-mediated phagocytosis. Mol. Biol. Cell 17: 3964-3977. Huynh, K. K., J. G. Kay, J. L. Stow, S. Grinstein. 2007. Fusion, fission, and secretion during phagocytosis. Physiology 22: 366-372. Jahn, R., T. Lang, T. C. Sudhof. 2003. Membrane fusion. Cell 112: 519-533. Sudhof, T. C.. 2004. The synaptic vesicle cycle. Annu. Rev. Neurosci. 27: 509-547. Martinez, I., S. Chakrabarti, T. Hellevik, J. Morehead, K. Fowler, N. W. Andrews. 2000. Synaptotagmin VII regulates Ca(2+)-dependent exocytosis of lysosomes in fibroblasts. J. Cell Biol. 148: 1141-1149. Reddy, A., E. V. Caler, N. W. Andrews. 2001. Plasma membrane repair is mediated by Ca(2+)-regulated exocytosis of lysosomes. Cell 106: 157-169. Roy, D., D. R. Liston, V. J. Idone, A. Di, D. J. Nelson, C. Pujol, J. B. Bliska, S. Chakrabarti, N. W. Andrews. 2004. A process for controlling intracellular bacterial infections induced by membrane injury. Science 304: 1515-1518. Czibener, C., N. M. Sherer, S. M. Becker, M. Pypaert, E. Hui, E. R. Chapman, W. Mothes, N. W. Andrews. 2006. Ca2+ and synaptotagmin VII-dependent delivery of lysosomal membrane to nascent phagosomes. J. Cell Biol. 174: 997-1007. Lindmark, I. M., A. Karlsson, L. Serrander, P. Francois, D. Lew, B. Rasmusson, O. Stendahl, O. Nusse. 2002. Synaptotagmin II could confer Ca2+ sensitivity to phagocytosis in human neutrophils. Biochim. Biophys. Acta 1590: 159-166. Breton, A., A. Descoteaux. 2000. Protein kinase C-α participates in FcγR-mediated phagocytosis in macrophages. Biochem. Biophys. Res. Commun. 276: 472-476. Brumell, J. H., J. C. Howard, K. Craig, S. Grinstein, A. D. Schreiber, M. Tyers. 1999. Expression of the protein kinase C substrate pleckstrin in macrophages: association with phagosomal membranes. J. Immunol. 163: 3388-3395. Larsen, E. C., J. A. DiGennaro, N. Saito, S. Mehta, D. J. Loegering, J. E. Mazurkiewicz, M. R. Lennartz. 2000. Differential requirement for classic and novel PKC isoforms in respiratory burst and phagocytosis in RAW 264.7 cells. J. Immunol. 165: 2809-2817. Zheng, L., T. P. Zomerdijk, C. Aarnoudse, R. van Furth, P. H. Nibbering. 1995. Role of protein kinase C isozymes in Fcγ receptor-mediated intracellular killing of Staphylococcus aureus by human monocytes. J. Immunol. 155: 776-784. Zheleznyak, A., E. J. Brown. 1992. Immunoglobulin-mediated phagocytosis by human monocytes requires protein kinase C activation: evidence for protein kinase C translocation to phagosomes. J. Biol. Chem. 267: 12042-12048. Ng Yan Hing, J. D., M. Desjardins, A. Descoteaux. 2004. Proteomic analysis reveals a role for protein kinase C-α in phagosome maturation. Biochem. Biophys. Res. Commun. 319: 810-816. Fukuda, M., R. Sagi-Eisenberg. 2008. Confusion in the nomenclature of synaptotagmins V and IX: which is which?. Calc. Bind. Prot. 3: 1-3. Saegusa, C., M. Fukuda, K. Mikoshiba. 2002. Synaptotagmin V is targeted to dense-core vesicles that undergo calcium-dependent exocytosis in PC12 Cells. J. Biol. Chem. 277: 24499-24505. Gut, A., C. Kiraly, M. Fukuda, K. Mikoshiba, C. Wollheim, J. Lang. 2001. Expression and localisation of synaptotagmin isoforms in endocrine (β)-cells: their function in insulin exocytosis. J. Cell Sci. 114: 1709-1716. Iezzi, M., G. Kouri, M. Fukuda, C. B. Wollheim. 2004. Synaptotagmin V and IX isoforms control Ca2+-dependent insulin exocytosis. J. Cell Sci. 117: 3119-3127. Lodge, R., A. Descoteaux. 2005. Leishmania donovani promastigotes induce periphagosomal F-actin accumulation through retention of the GTPase Cdc42. Cell. Microbiol. 7: 1647-1658. Rees, S., J. Coote, J. Stables, S. Goodson, S. Harris, M. G. Lee. 1996. Bicistronic vector for the creation of stable mammalian cell lines that predisposes all antibiotic-resistant cells to express recombinant protein. BioTechniques 20: 102-104. 106, 108–110. Stacey, K. J., I. L. Ross, D. A. Hume. 1993. Electroporation and DNA-dependent cell death in murine macrophages. Immunol. Cell Biol. 71: 75-85. Flandin, J. F., F. Chano, A. Descoteaux. 2006. RNA interference reveals a role for TLR2 and TLR3 in the recognition of Leishmania donovani promastigotes by interferon-γ-primed macrophages. Eur. J. Immunol. 36: 411-420. Lodge, R., T. O. Diallo, A. Descoteaux. 2006. Leishmania donovani lipophosphoglycan blocks NADPH oxidase assembly at the phagosome membrane. Cell. Microbiol. 8: 1922-1931. Li, C., B. Ullrich, J. Z. Zhang, R. G. W. Anderson, N. Brose, T. C. Sudhof. 1995. Ca2+-dependent and -independent activities of neural and non-neural synaptotagmins. Nature 375: 594-599. Bai, J., E. R. Chapman. 2004. The C2 domains of synaptotagmin: partners in exocytosis. Trends Biochem. Sci. 29: 143-151. Mori, Y., M. Higuchi, Y. Hirabayashi, M. Fukuda, Y. Gotoh. 2008. JNK phosphorylates synaptotagmin-4 and enhances Ca2+-evoked release. EMBO J. 27: 76-87. Haberman, Y., I. Ziv, Y. Gorzalczany, M. Fukuda, R. Sagi-Eisenberg. 2005. Classical protein kinase C(s) regulates targeting of synaptotagmin IX to the endocytic recycling compartment. J. Cell Sci. 118: 1641-1649. Braun, V., F. Niedergang. 2006. Linking exocytosis and endocytosis during phagocytosis. Biol. Cell 98: 195-201. Zhang, Q., D. Cox, C.-C. Tseng, J. G. Donaldson, S. Greenberg. 1998. A requirement for ARF6 in Fcγ receptor-mediated phagocytosis in macrophages. J. Biol. Chem. 273: 19977-19981. Allen, L. A., C. Yang, J. E. Pessin. 2002. Rate and extent of phagocytosis in macrophages lacking vamp3. J. Leukocyte Biol. 72: 217-221. Xu, S., A. Cooper, S. Sturgill-Koszycki, T. van Heyningen, D. Chatterjee, I. Orme, P. Allen, D. Russell. 1994. Intracellular trafficking in Mycobacterium tuberculosis and Mycobacterium avium-infected macrophages. J. Immunol. 153: 2568-2578. Ramsden, A. E., D. W. Holden, L. J. Mota. 2007. Membrane dynamics and spatial distribution of Salmonella-containing vacuoles. Trends Microbiol. 15: 516-524. Murray, R. Z., J. G. Kay, D. G. Sangermani, J. L. Stow. 2005. A role for the phagosome in cytokine secretion. Science 310: 1492-1495. Pagan, J. K., F. G. Wylie, S. Joseph, C. Widberg, N. J. Bryant, D. E. James, J. L. Stow. 2003. The t-SNARE syntaxin 4 is regulated during macrophage activation to function in membrane traffic and cytokine secretion. Curr. Biol. 13: 156-160. Stow, J. L., A. P. Manderson, R. Z. Murray. 2006. SNAREing immunity: the role of SNAREs in the immune system. Nat. Rev. Immunol. 6: 919-929.